Helen questions Paul about his melancholy behaviour. Paul explains he'd hoped Nick Burman would have come back to him about the airline steward job and that he feels bored with the way his life is heading. Helen suggests Paul apply for the job on his own merits and Paul agrees she is right. Maria and Nick tell an excited Danny he is going Nick on a surprise outing. Shane however is not impressed with the suggestion. After Danny and Nick leave, Shane complains to his mother that he feels Nick could hinder Danny resolving his issues with Max. Paul arrives and pressures the secretary of recruitment officer Dean Canning to allow him to get an appointment to see Dean. Paul's luck is in and gets an interview. Nick and Danny arrive with Danny realising Nick is going to take him flying in a private plane – Danny complains that Max would never have done this for him. Nick agrees with him and they set about planning the flight route. Nearing the end of his interview, Paul passionately tells Dean Canning he really wants the airline steward job – Dean is impressed enough and calls personnel officer Kathy Woodfield. Danny is excited as he and Nick take off in the plane and he stares down at the city below. Shane visits Daphne to complain to her about Nick – but he can see she is upset. Daphne tells him she feels responsible for Des losing his promotion at the bank and he now faces being sacked too. Daphne tells Shane she's decided to give Des her notice and move out of Ramsay St.
Danny and Nick land and after getting out of the plane, Danny tells Nick he now loves flying! They both go for a coffee. Paul defends Kathy's accusation that he's only leaving Uni to go against his father's wishes – Dean canning enters the room and lets slip that Kathy is new to the job. After he leaves, Kathy apologises to Paul for being too hard on him and tells him she is going to recommend him for the job. 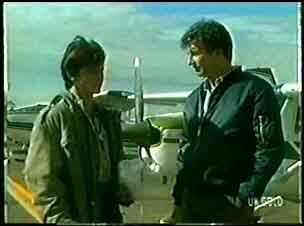 While having coffee Nick tells Danny he could train to be a pilot – Danny asks Nick why he is so interested in him and Nick tells him he's the kind of son he always wanted. Danny replies he'd prefer Nick over Max to be his father. Nick tells him Max does love him. Danny invites Nick back home to dinner. Max is furious and shouts for the noise of a party to be turned down. Shane arrives before going on to get a compensation claim for his accident. Shane asks max to tell him the reason why he and Maria split up – Max tells him only if Maria agrees. Jim isn't impressed with Helen encouraging Paul to apply for the steward job but she tells him Paul is in control of his own life and Jim should allow him to make these choices. Maria refuses to allow Danny to go sky diving. Shane can only glare at Nick. Max phones to speak to Maria but they cannot hear each other due to the noise of the party at his block of apartments. Max asks a puzzled Maria to go out to dinner with him. Jim questions Paul about the airline job but Paul silences his father by agreeing he'll finish his degree. Nick leaves after having dinner with the Ramsay's. Danny tells Shane that he dislikes Nick because Danny is the centre of attention for a change – Shane tells him he only wants their parents to be reconciled and believes they still can. Danny tells Shane he doesn't want Max back.